Barrett is excellent, excellent! at playing by himself. Now, William is too, but William also frequently asks me to play with him, to help him with his toy dilemmas, and to tell him what to play with next ("Mom, we have nothing to do," a phrase that always results in helping me with the dishwasher, of course). And this must be the difference between the first born in the middle, but William is 90% more likely to yell, "Mom, watch me! Mom, look what I made!" Barrett is the source of his own gratification. Barrett seems to like working alone. Even at times when the whole family will be sitting on the floor playing with something together, he'll run off and do his own thing somewhere else. A few nights ago, we were enjoying a rare moment, all of us sitting on the carpet playing with the tegu blocks, and Barrett was off in the piano room, alone, racing cars down the car garage ramp. He's so adorable, with his purposeful little run when he gets an idea for play. 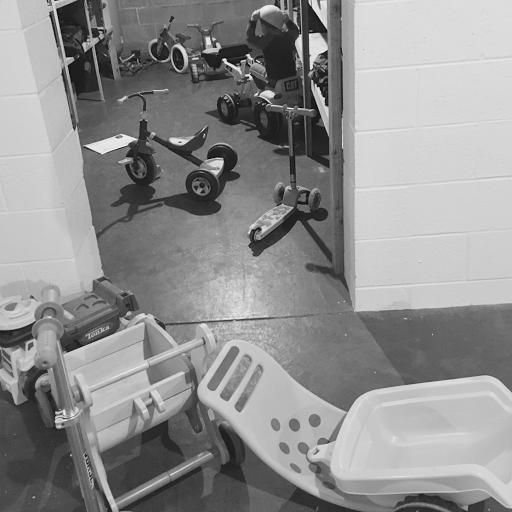 Yesterday, in the basement, while I was working out and the boys were playing, he put on his little hard hat and began systematically moving every ride-on toy into daddy's hunting closet. When I looked in and saw them, all at that moment lined up in a perfect row, he threw his hands up in the air and proudly said, "These all my vehicles."